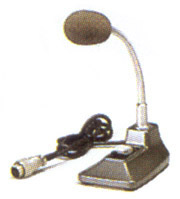 The Icom SM-6 is a unidirectional, electret microphone designed for base station operation with many Icom transceivers. (It cannot be used with non-Icom transceivers since the power is supplied from the connected transceiver). The SM-6 features a switch for PTT (push to talk) and also a lock feature. There is a removable foam windscreen. There is a free-bending neck for convenient adjustment. On the bottom of the base there is an adjustment for the mic preamp. This mic is powered from the Icom transceiver. 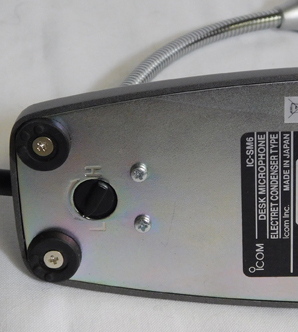 The mic cable terminates to a standard Icom 8 pin mic plug. This mic works with the 28, 78, 271, 275, 471, 475, 718, 745, 746, 746 Pro, 756, 756 Pro, 756 ProII, 775, 781, 900, 901, 970, 1275 and many others.